Organize project documents in folder structures. On the Documents page, on the Edit tab in the Folder group, you can create new folders, rename already existing folders or delete them. On the left side of this page, the current folder structure is displayed. Alternatively, you can click Documents, Folder structure in the InLoox PM options to define whether specific subfolders are created automatically on the Documents page. The folder structure that you create in the InLoox PM options is displayed automatically as soon as you add the first document to the respective project. 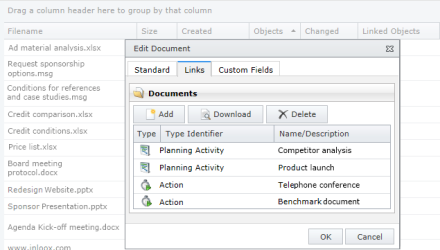 For more information on how you create document folders, see Create a subfolder. The InLoox PM Web App document list now offers a current overview of all project documents and document links in use. So, you can navigate directly from the document list to the linked planning or time tracking element or open the related project document directly from the element. For more detailed information on this topic, see Create and edit a document and the respective help categories. New Document Features in InLoox PM 7 Web App • Copyright 1999-2019 © InLoox GmbH. Tous droits réservés.